I have the most lovely friends. After hosting a couple of them to afternoon tea last week, my friend and colleague, Amanda surprised me with a wee giftie as we were driving in to teach Musical Theatre to 6 year olds, VERY early last Saturday morning. 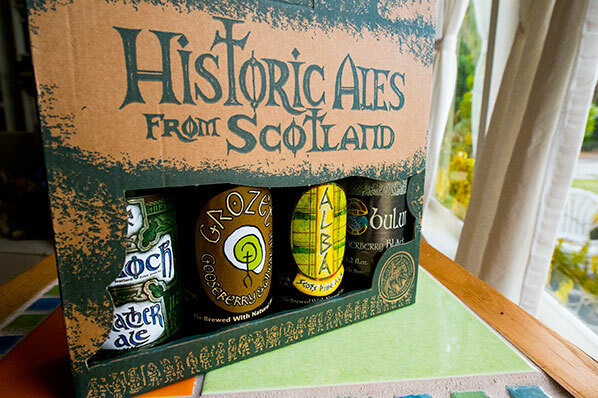 As the gift was a beautiful box of four Historic Ales From Scotland, we both deemed it best to save them for later. And I immediately decided that at least one of them had to be made into chocolates (not to be confused with my exploration two years ago of chocolate beer). My large extended family, in all their eccentric glory, hails from Scotland. They are generous, funny, opinionated and listening to them (especially when they are all talking over each other at family gatherings) reminds me of my Mum and Dad, who I miss terribly. Mum and Dad were never big drinkers, certainly not of ale (Mum did like a wee sherry on New Year’s Eve) but I think even they might appreciate these beautiful bottles, the labels designed by 3rd year students at the Glasgow School of Art. I take a closer look at my gift to discover a bit more about its makers. Heather Ale Limited was the brainchild of Bruce and Scott Williams, of Williams Brothers Brewing Company, who owned a brew shop in the town of Partick, an area of Glasgow on the North bank of the River Clyde in Scotland. When a woman came into the shop with a translation of a centuries old recipe for heather ale, the brothers became intrigued. She wanted to see if they could reproduce a batch of the old Celtic ale for her family members. 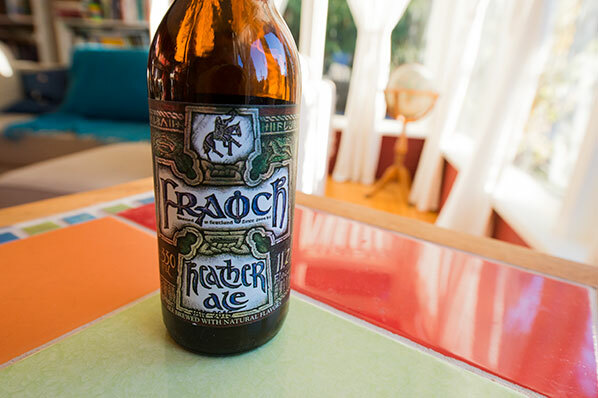 They started brewing “Fraoch” in 1992: Fraoch Leanne is the Celtic for heather ale, from the purple heather flowers which grow in abundance all over the Scottish highlands, and harvested during August and September. a spruce and pine ale. Pure malted barley is boiled with young sprigs of pine for several hours then fresh shoots of spruce are added for infusion before fermentation. an elderberry black ale. Made from roasted oats, barley and wheat boiled with herbs, then fermented with ripe elderberries. a seaweed ale. Made with bladderwrack seaweed and organic barley, apparently this is a rich chocolate ale with an aroma of sea breeze (this was the only one not included in my gift pack). Grozet (an old Scots word for Gooseberry): brewed with lager malt, wheat, bog myrtle, hops and meadowsweet then secondary fermented with ripe Scottish gooseberries. Described in the Scottish press as “light pale ale with champagne”. It must be said – I do not drink beer or ale, so the subtleties of flavour and care that has gone into the brewing of these beverages would be lost on me. But I love heather, and a good story, and I know my friend will forgive me for using this singular ale in a batch of truffles … especially as I am planning to give them to her. And how could you not love the description of how this ale is made? Boiling Bree – sounds positively Shakespearean. And I think this recipe, from the Ecole Chocolat recipe page, for Paul Young’s Traditional-Ale Truffles will be a nice homage to the skill of both the brew master and the chocolatier. He used a rich malty London ale, which would contain a good deal of hops. Hopsh was not introduced into Britain until the 18th centuryand imparts a different quality of bitterness (which balances the sweetness of the malt) to the heather. Hmmm, clearly I have been enjoying learning all this historical herb lore. I also learned that the term for this herb mixture, used for bittering and flavouring ale before hops became popular, is called Gruit. 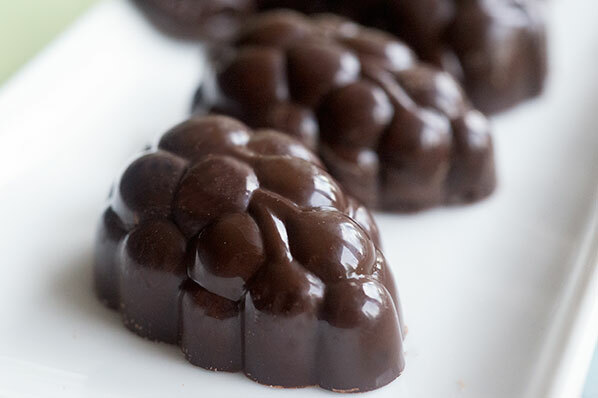 So, I make Gruit truffles. It is a lovely, easy recipe to work with and the only change I made to the method was to stir the warmed ale/sugar mixture into the milk chocolate (which I warmed over a bain marie, until half-melted) in several additions, by hand, with a silicone spatula. I was worried if I used the blender method, suggested by Chef Young, I would incorporate air into the ganache. 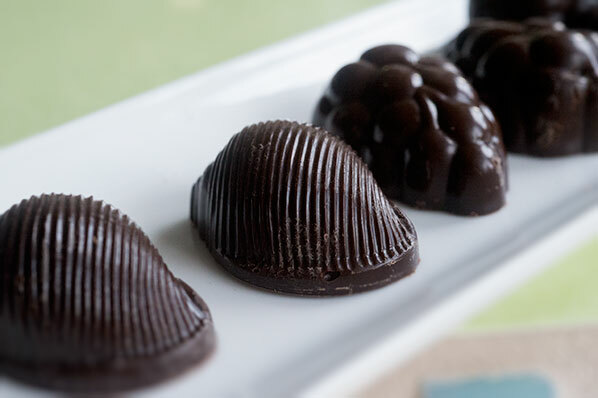 The cooled ganache was very soft, and a good consistency for piping into molded tempered dark chocolate shells. This I did, using a large Zip-Lock freezer bag with a corner snipped off as a piping bag. 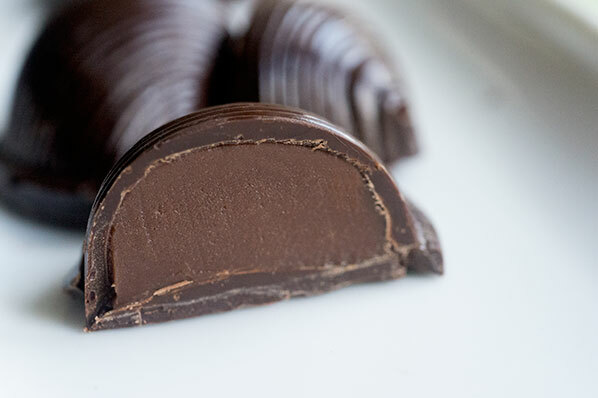 According to my family, who are always my first tasters, the finished chocolates have a smooth, creamy, delicate quality, and the flavour seemed to improve after a couple of days. I found them quite sweet, and could not taste any ale at all, rather a more pronounced taste of the muscovado sugar, but it was quite pleasant. I presented the finished truffles to my friend as we drove to our next class. I received word from her the following morning that she’d had one with her first cup of coffee of the day.